It’s the simplest, least expensive way to extract concentrate from raw buds or refine hash for more effective dabbing; instead of a chemical process, rosin tech relies on heat and pressure to squeeze cannabinoids and terpenes from the source material. It is a very fast process; a batch of rosin can be produced in moments and consumed immediately. The physical science of rosin is simple: Applying heat melts the terpenes and cannabinoids into a pliable resin. Then it is squeezed using a press. Some lipids and waxes melt at the same temperatures. Thus, the finished product is generally not as refined as the results of some other methods. One tradeoff is the speed and ease of extraction. There is a wide range of tools and equipment that can be used to make rosin. The choice depends mostly on the quantity being pressed. On the hobby level, you can use household items. The easiest way to understand rosin is to make a small batch on your own. It’s simple and requires very little equipment. • Buds — for our purposes, use 1-7. Our goal is to learn the process and taste your first homemade product. • Tong-style hair-straightener/flat iron — there are several factors to consider here, but the biggest obstacles are heat and durability. Some popular models like the Remington have minimum settings too hot to leave the device on during pressing, meaning you have to warm it, turn it off and use a laser thermometer “heat gun” to ensure ideal temp. If you’ don’t have access to a heat gun, some-thing inexpensive like the 2-inch model from Conair will allow you to “set and forget” the heat, because the lowest setting is generally cool enough for rosin extraction. However, part of the lower cost comes from a more brittle plastic housing for the heating plates, meaning the Conair is more susceptible to physical cracking and breakage. A model with a digital temperature readout is also a good choice for irons that do have temp settings low enough for rosin. • Parchment paper — but NEVER wax paper, because you don’t want wax to melt into your final product, and it will if you use wax instead of parchment paper. You can also use silicone mats and other heat-resistant material, but for your first press parchment is fine. • Bar clamp (optional) — pressure is half of the magic behind rosin, so you have to ensure you have enough. When pressing small quantities manual pressure is generally adequate, but for a more efficient press and a higher yield clamps can be applied to the outside of the iron. 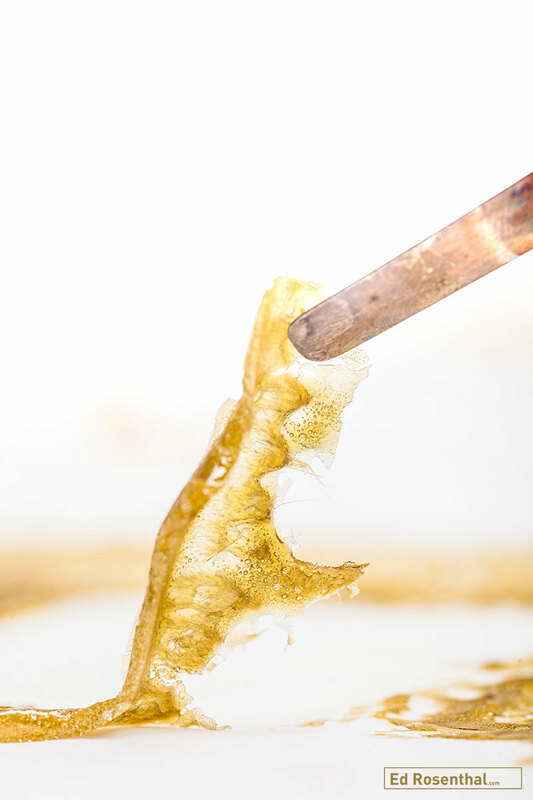 • Micromesh/silkscreen filters (optional) — pressing rosin tends to spread the extracted concentrate outward from the buds being pressed, meaning screens aren’t always strictly necessary to keep plant material out of the final product. However, to ensure a product free of particulates you can wrap your bud in silkscreen or micromesh material. Some people also use unbleached tea bags for these smaller batches of flower rosin. • Protective work gloves — It’s pretty difficult to injure yourself making rosin, especially using this method, but it’s not impossible. Wearing work gloves protects your hands from painful burns, which a hair straightener is more than capable of inflicting. • Plug in the flat iron and set it to the target temperature. • If you have a model with a digital temperature display, set it between 280F and 330F. • Place your bud inside the tea bag or filter (if applicable) and fold it inside folded parchment paper. • Ensure the iron is still at the proper temperature and that the bud is secured in its envelope, then clamp the envelope with the flat iron, focusing the pressure on the buds in the middle. If you’re using clamps, tighten them for 3-8 seconds — you know you’re done when you hear the sizzle sound of resin escaping and interacting with the heat. 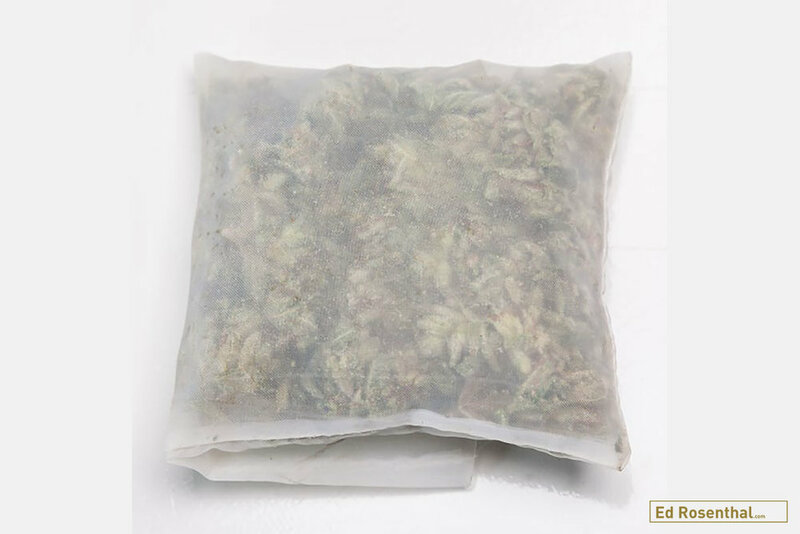 • Unclamp the iron, open the envelope and pluck the buds out — this step is another reason many people use bags and filters, because it reduces the opportunity to contaminate an otherwise clean rosin batch while removing plant material. • Take your envelope of warm rosin, refold it and roll or spread out your rosin as desired. Then place the envelope on a cool surface for a minute or so before opening and collecting the rosin. Now it’s time to dab the rosin! 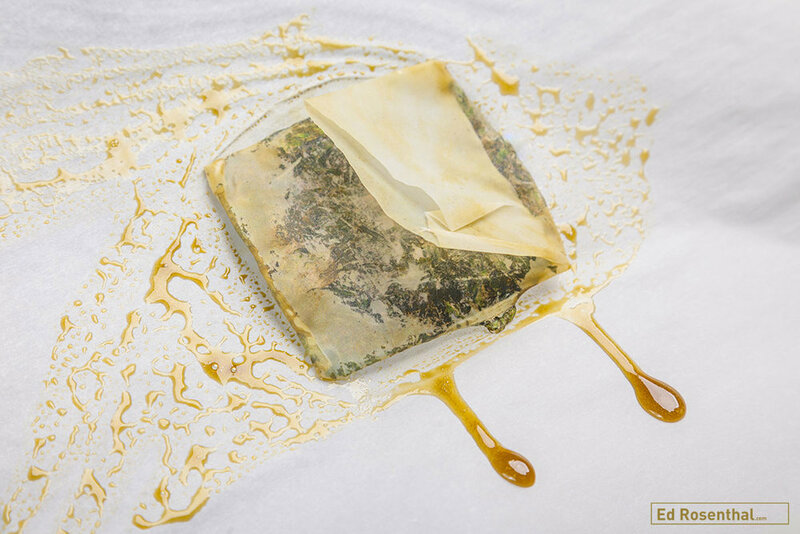 The main drawback to rosin is that it is best consumed fresh because it does not retain its terpenes as well as other cannabis concentrates, so it goes stale quicker, especially when it isn’t kept in a cool environment. This is something to consider when deciding how much rosin to make at a time.